If you want to show your calculator in a Wordpress page, you can use the WoooCommerce shortcode [product_page id="PRODUCT_ID"] to do that. How to use your Shortcode? In this example, it is explained how to show the calculator on a Wordpress "Page" (But of course you can add this shortcode wherever you want on your Wordpress website). This piece of code checks if the price is 0, in this case, an error message will be shown and the product will be removed from the cart, so the customer cannot buy it. 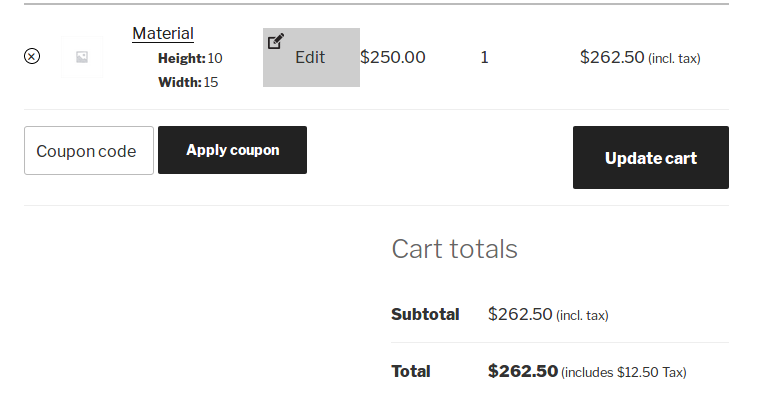 If you want to do more validation before adding a product to the cart (For example if you want to check "height + width" is less than a predetermined value), then this article is for you. Using WooPrice Calculator you can set a minimum and maximum values for each field but you cannot validate more complex rules. 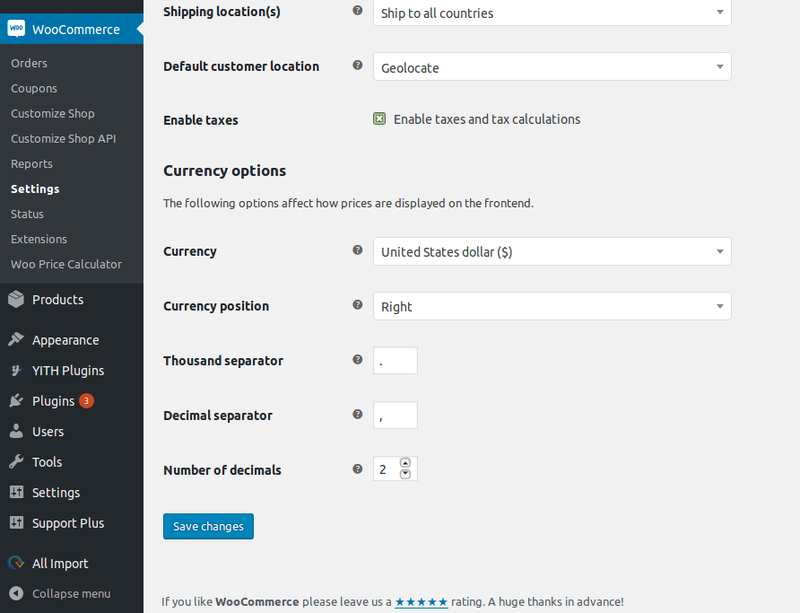 With Wordpress, WooPrice Calculator and WooCommerce this is really simple by using filters. You can use the filter "woocommerce_add_to_cart_validation" to do that. How to make the validation? For example, if you want check "height + width" must be less then 2000, you can append this new PHP function to your "functions.php" file, located in "/wp-content/themes/YOUR_THEME/": path. As you can see from the picture above, you will notice that there are the normal product price and the total price with tax applied in the Cart. Without the tax, the total price would be the same as the product price. If you see wrong formatting while you are uploading your Excel file on WooPrice Calculator, never mind and please go ahead because there are numerous ways provided which allow you to change the price and numeric format after you have uploaded your Excel file. From your Wordpress back-end click on "WooCommerce"
Q: Yes, but what cache do I need to clear? You need to clear the cache of your Wordpress cache plugins. Q: I'm a web designer, how do I clear the cache of my browser? For Chrome check out this video. For Firefox just hint CTRL+F5 on Windows and Linux. On Apple hint Apple+R.